When you complete an Ironman less than 30 days before the Chicago Marathon--and you're planning on running that too--you almost have to set yourself up for failure. Or at least know that it might take a miracle to either run a personal best, break a lofty goal you have after other sub-par efforts in the last year, or win a bet that you set with your dad (I still don't know why I agreed to that one fresh off the Ironman). You lower your expectations, I did anyway. First because I would only be 28 days post-Ironman--even if that marathon is more of a trot, walk, push, struggle to the finish line no matter what. And then as I watched Sunday's forecasted temperatures only rise higher and higher, I knew I'd have to pull something out of my bag of tricks--if there was even anything left since I'm convinced I used them all during the 112-mile Ironman bike--to run well in the heat. What a difference a year makes--and not just from one temperature extreme to the other. It was 67 degrees at this year's race start (so I heard), whereas last year it was 33 degrees (or somewhere in the 30s). Last year, I was sitting on my couch after the race wondering how I accomplished what I accomplished. Yes, not exactly the choicest of words, but even a year later I still don't know how I PR'd in a race that I didn't even think I'd be able to run until mere days before. Long story short: I ran too much, stressed out my calf and Achilles, and landed myself in physical therapy from mid-September until two days before the marathon. I had to promise my therapist that I'd pull out of the race if anything started to hurt or flare up to only be cleared to toe the line for my 10th Chicago Marathon. Because of that, because of the ideal cold temps and because of my time, I don't have a 2009 race report to link back to--it's like I still think it's a dream...not real enough to write down (beware, I might return a year later and finally knock one out because I do still remember that ideal race day, believe it or not). I said that this year's race--my 11th, and as someone at Nike's running summit pointed out on Saturday, a third of all of the Chicago Marathons ever run (33)--was a big question mark. I said that last year, too, because I had to thanks to my injury. But I also tried to return to the course with zero expectation, something that proved successful in that 2009 effort. I should know better...any time I think I've figured out the patterns with my Chicago Marathon running, I'm thrown for a loop. I'll save that for another time though because my marathon analyses could stretch too long and turn into an irrelevant rant for this report anyway. Basically, the only racing I did was in the first seven or so miles. 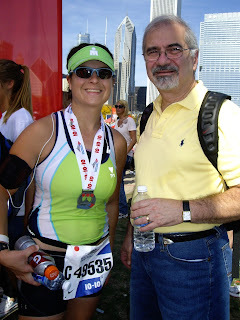 Then I started to feel the heat, my pace started to slow and all hell broke loose--I was doing things during the race that I've never done in all 18 of my marathons that include Chicago, Boston, Grandma's and California International but minus the two during Ironmans where I used the port-a-potties. Like use the bathroom at mile 10. Like grab tissues from the medical tent to blow my allergy-induced stuffy nose. Like stop...not once, not twice, but three times to retie my shoe because it felt loose (one), to yank on my sock to pull it higher (two), to yank on the other sock for the same reason (three). Like walk at mile 10--even in the 2007 race, the hottest I've run, I waited until halfway through mile 11 to walk and bail on a good race day. Like visit multiple tables for fluids and drink two cups of Gatorade, thinking it would make my cotton mouth vanish. Like miss spotting my parents in Greektown, a post I've caught them at every year they started making the trek there to watch me run by. Like want to walk the final 0.2 mile along Columbus because I simply didn't care about running or feel that proud of my time, accomplishment or race day. Like look at my blood-stained left shoe (a remnant from Ironman that decided to pop under pressure) and take it as a sign that running wasn't a good idea. Like grab the perfect banana at an aid station (I'm a picky banana eater and love the green-speckled ones, often a hard find at races), proceed to peel it and then watch it fall to the ground before I can put it in my mouth. Like psych myself into thinking I could have a good day because others told me I would. A lapse in judgment and I forgot that I'm the one who needs to tell myself I'm ready or expect nothing and be surprised at the outcome. Like high-five my dad when I saw my parents at mile two and shout to my friend when I spotted him at mile five (quite possibly the only positive firsts). But that's sometimes what races are for: To learn from your mistakes and fix them before the next effort. And that's just what I'll be doing. Except for some shorter distances and runs for fun, I'm not running for a while (OK fine, I didn't really do that much this year anyway). But I do plan to delve head-first into training for the 2011 Boston Marathon so instead of dogging it as I have the last three times I've run it, I can re-qualify to return in 2012. That means actually training, actually running instead of creating excuses for why I didn't run or couldn't run fast, and actually setting my sites on a good Boston race day instead of a so-so one because of other events down the road. I'm not quite sure yet as to how I'll do it but I'm accepting applications for coaches, motivational tips, advice, training plans and the like. For now, I'm putting the 2010 Chicago Marathon to bed. Photo courtesy of my mom, taken at Runner Reunite. Sorry Dad, I didn't want to crop you out even though you don't look like the happiest race spectator.